Background: Scabies is an ancient disease (documented as far back as 2500 years ago). It affects about 300 million people annually worldwide, and the prevalence is as high as about 60% in Indigenous and Torres Strait Islander children in Australia. This is more than six times the rate seen in the rest of the developed world. Scabies is frequently complicated by bacterial infection leading to the development of skin sores and other more serious consequences such as septicaemia and chronic heart and kidney diseases. This causes a substantial social and economic burden especially in resource poor communities around the world. Discussion: Very few treatment options are currently available for the management of scabies infection. In this manuscript we briefly discuss the clinical consequences of scabies and the problems found (studies conducted in Australia) with the currently used topical and oral treatments. Current scabies treatment options are fairly ineffective in preventing treatment relapse, inflammatory skin reactions and associated bacterial skin infections. None have ovicidal, antibacterial, anti-inflammatory and/or anti-pruritic properties. 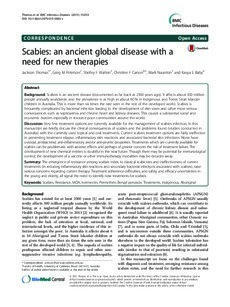 Treatments which are currently available for scabies can be problematic with adverse effects and perhaps of greater concern the risk of treatment failure. The development of new chemical entities is doubtful in the near future. Though there may be potential for immunological control, the development of a vaccine or other immunotherapy modalities may be decades away. Summary: The emergence of resistance among scabies mites to classical scabicides and ineffectiveness of current treatments (in reducing inflammatory skin reactions and secondary bacterial infections associated with scabies), raise serious concerns regarding current therapy. Treatment adherence difficulties, and safety and efficacy uncertainties in the young and elderly, all signal the need to identify new treatments for scabies.